Saeed Hamid. Photo: Internet Source. A MAN who was said to be a Hindu priest and another who was said to be a computer technician, appeared at the Fort Wellington Magistrates’ Court in Region Five (Mahaica-Berbice) Wednesday on the capital charge of murder. 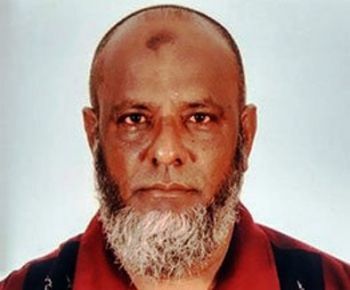 Pandit Satrohan Madray, called “Bluey” aged 31 and Computer Technician Antonio Singh Balrup, also aged 31 were charged separately with killing food vendor Saeed Hamid aged 56 at D’Edward Village, West Bank Berbice on April 19th last. Madray’s address was given as Lot 1 Section G D’Edward Village, West Bank Berbice and Balrup’s as Lot 213 A Bath Settlement Village, West Coast Berbice. Media reports earlier this month stated that Food vendor Hamid aka “Saho”left his home at Lot 41 Queenstown, Corriverton in Region Six (East Berbice-Corentyne) around 09:00hrs on Thursday, April 19th 2018 last. He was last seen entering a white Toyota Premio at the Palmyra bridge entrance also in East Berbice on the same date and had not been seen nor heard from since. Police investigating his disappearance got a break in the case after phone records they obtained reportedly showed that two men were in communication with Hamid at the time he went missing. Police investigators were reportedly subsequently led by the two suspects to the back of a Mandir at D’Edward Village, West Bank Berbice, owned by Madray, where a pile of what appeared to be charred human bones were found. The bones are to be subjected to DNA tests to verify the identity of the person who had died. Magistrate Rhondell Weever, who read the capital charge to Madray and then to Balrup, remanded them to prison until July 17th, 2018, pending a police progress report.